The Qataris have finally won over the Wharf's major shareholders - and there's nothing the board can do about it. As the mist (or rainclouds) rose over Canary Wharf this morning, the battlefield was remarkably bloodless. But make no mistake, the fight for the financial district, which has concluded with Qatar persuading the three major shareholders to accept its £2.6bn bid, has been brutal. In a stock market statement this morning, Songbird Estates, which owns 69.4% of Canary Wharf Group, said New York tycoon Simon Glick, China Investment Corporation and Morgan Stanley had accepted the 350p per share offer. They are the three largest shareholders after the Qatar Investment Authority itself, which owns 28.6% of Songbird. Back in December, the Songbird board had rejected the hostile offer, saying it was well below an independent valuation of 381p a share. Joint bidders QIA and Canadian property investors Brookfield, which owns 22% of CWG, hit back, arguing it was worth 304p when debts and liabilities were taken into account. Looks like Songbird’s music was not particularly persuasive. QIA and Brookfield now effectively control 85.6% of Songbird’s shares, according to the statement. With 90% of shares they have the right to forcefully buy out the remaining minority shareholders. Either way, they could de-list the company from London’s AIM market if they so please. 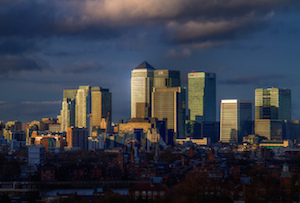 Whatever their decision, it looks likely Canary Wharf’s ownership structure will be simplified. US asset manager Franklin Mutual Advisers owns 7% of the whole group and has hinted it’s happy to sell its stake to QIA. And Songbird’s minority investors may well be singing to the same tune: 21% of its shares are freely floated and those were up more than 7% to 345p in mid-morning trading. So Qatar finally gets its hands on the 34 office buildings that make up the riverside financial district. With other London landmarks including the Shard, Chelsea Barracks, The Savoy hotel and Harrods, the oil-rich (well not quite so rich at the moment…) sheikhdom is building up quite the trophy property portfolio.